Adding two-factor authentication is an excellent way to reduce fraud and increase trust from your users. This quickstart guides you through building a Java Servlets and AngularJS application that restricts access to a URL. 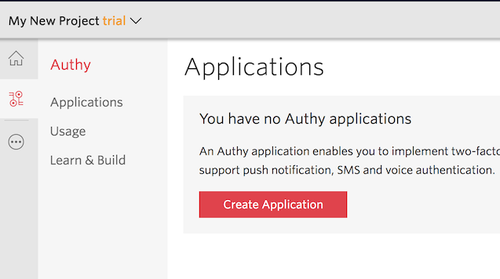 Four Authy API channels are demoed: SMS, Voice, Soft Tokens and Push Notifications. Ready to protect a toy app from malicious hackers? Dive in! Next, open the file .env.example. There, edit the ACCOUNT_SECURITY_API_KEY, pasting in the API Key from the above step (in the console), and save the file as .env before sourcing it. In Windows, set the ACCOUNT_SECURITY_API_KEY variable manually. And there you go, Authy Two-factor Authentication is on and your Java app is protected! Now that you are keeping the hackers out of this demo app using Twilio Authy Two-factor Authentication, you can find all of the detailed descriptions for options and API calls in our Two-factor Authentication API Reference. If you're also building a registration flow, also check out our Phone Verification product and the Verification Quickstart which uses this codebase. For additional guides and tutorials on account security and other products, in Node.js and in our other languages, take a look at the Docs.